Keyboard bug take the Bug 1000000 !! I have been reproducing this since a couple of days, on several devices (Nexus S, Desire Z for instance). In my case, language was French. 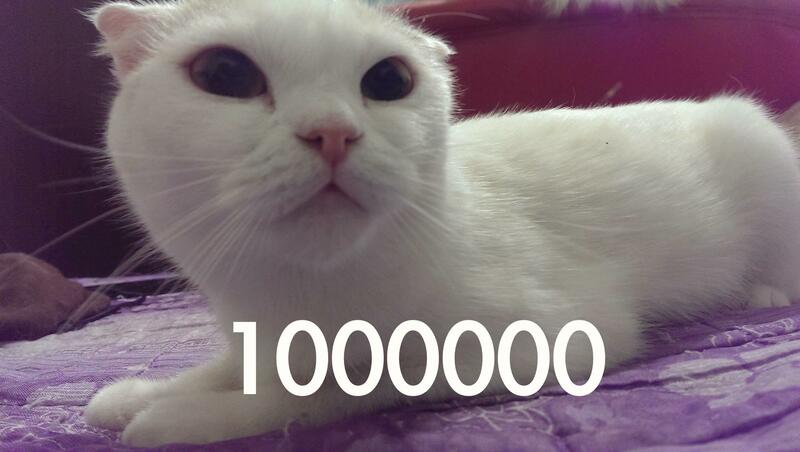 Happy 1 000 000 bug ! Guess who will close this bug as soon as possible? Rudy, will you? Who want to fix this bug :)? render.js:getScale apparently has a bug. We don't want to set overflow on these fields as they would cause more reflows I believe. https://github.com/mozilla-b2g/gaia/blob/master/apps/keyboard/js/render.js#L934 might also not be correct. Should be (6 * (screenInPortraitMode() ? cachedWindowWidth / 32 : cachedWindowWidth / 64)). Could cause the issue. There have been recommendations to refile this bug to let people celebrate 1 million bugs here, so I filed the issue again as bug 1000025. Need lots of myselfinformation about these. > Need lots of myselfinformation about these. > I meant: about cheese. feel free to send pull requests to me for 2,000,000!! Happy bug 1000000 to everyone! http://i.imgur.com/H7wZpUS.jpg This is my cat named for "bug". A party was suggested back in 1999 - see Bug 9940. Happy bug day all! What I would like to know is how many bugs we have fixed/resolved. NOOOOOOO NOT AGAIN! WHEN CAN WE MFBT 1 MILLION!1!1111! This is only the Mebibug. The real Megabug will be bug 1048576  (0x100000). > This is only the Mebibug. > The real Megabug will be bug 1048576  (0x100000). The summary says "byod" so I'm clearing needinfo, but someone have one for me! Clear steps to reproduce and a low barrier to participation, so flagging [good first bug]. Gerv, who won the competition? Who came closest to the actual date of filing? This somehow got dropped from an earlier patch. Nit: I believe you misspelled bugz here. Ship It! All Bug Are Belong To Us! But it's not the first bug, it's the one millionth boog! > But it's not the first bug, it's the one millionth boog! There aren't 1 000 000 bugs in Bugzilla, they are all features! Yééé ! 1 000 000 !!! It's a good chance for digging out some history of Mozilla Bugzilla. It seems the oldest valid bug is bug 507, which was marked INVALID. I wonder what's the oldest OPEN bug right now? > what's the oldest OPEN bug right now? Bug 540, and we have 57 bugs with bug id < 10000 remain OPEN. Should we uplift the patch for this bug, https://bugzilla.mozilla.org/attachment.cgi?id=8411169, to fix all bug? > seems the oldest valid bug is bug 507, which was marked INVALID. xref Bug 35 - (firstBug) Navigator does not free preference hash table when exit. > https://bugzilla.mozilla.org/attachment.cgi?id=8411169, to fix all bug? This needs to land on trunk first. Everyone knows MegaBugs are traditionally measured in powers of 2, so our target is 1,048,576. 48K more to go, people. In the absence of Brendan, I'm asserting I have more authority to decide this issue than bsmedberg. Bug 1000000, yay! INVALID? Bah! I supposed this bug report would exist, but I'm still quite impressed that you managed to time it correctly to get the right bug ID. Now let's see if we reach 100 comments (we're close). Doesn't work on 6-digit display; may have compatibility issues with i18n if the language doesn't have a word for "million". Crashes on Firefox versions for architectures with less than 20 bits. Wake me up when we reach a round bug number, such as 1048576. Disregard; just realized you cheated by renaming the bug. Cheaters. 1000000 bugs and 100 comments! Congratulations to the Mozilla team for their effort, and to all who help them making this community work.